Centipedes and millipedes are not insects because they have more than six legs. Both of these groups of invertebrates have long segmented bodies with either one pair of legs (centipede) or two pairs of legs (millipedes) on each body segment. Centipedes have a pair of poison claws behind the head that they use to paralyze their prey. The jaws are too weak to penetrate human skin. If the bite is “successful,” the pain and swelling is no worse than a bee sting. When found in homes, the centipede is often found in moist basements, damp closets, and in bathrooms. A plentiful centipede population is often a sign of a moisture problem. Millipedes are usually brown to blackish in color with a rounded elongated body with no poison claws. When disturbed, they coil up similar to sowbugs and pillbugs, which are related invertebrates. Millipedes usually die once inside the home unless there is excessive moisture. To discourage centipedes and millipedes from entering your home, remove mulch and dead vegetation adjacent to your home. A pest control professional can also provide a perimeter application that will keep out a host of insects. The safest and most environmentally sound way to control millipedes and centipedes already in the house is to vacuum or sweep them up a well as taking steps to remove excessive moisture. Damp hiding places can be treated with appropriate indoor applications. These similar-looking pests are more closely related to shrimp and crayfish than insects. They are the only crustaceans that have adapted to living their entire life on land. Sowbugs and pillbugs live in moist environments outdoors but occasionally wind up in buildings. They do not bite, sting, transmit diseases, nor infest food, clothing or wood. They are a nuisance by virtue of their presence. These pests are scavengers that fed on decaying organic matter. They thrive in areas of high moisture. At night, they often invade crawl spaces, damp basements, and first floors of houses at ground level. Frequent indoor sightings mean that there are large numbers breeding on the outside close to the foundation. These pests do not survive indoors without very moist or damp conditions. 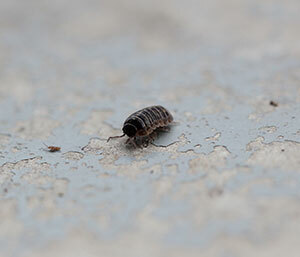 To control sowbugs and pillbugs minimize moisture and remove debris. Don’t allow water to accumulate near the foundation or in the crawl space. Water should be diverted away from the foundation wall with properly functioning gutters, downspouts, and splash blocks. Repair leaking faucets, water pipes, and leaking air conditioning units. Adjust lawn sprinklers to minimize puddling near the foundation. Reduce humidity in crawl spaces and basements by providing adequate ventilation and use of sump pumps. Moisture encourages the breeding of all insects and excess moisture in your home is an invitation to trouble – not just with sowbugs and pillbugs – but many other insects that seek out moist conditions in order to survive. Also, remove leaves, grass, mulch accumulations and similar items beside the foundation since these often attract and harbor sowbugs and pillbugs. Seal cracks and openings around the bottoms of doors and basement windows. By sealing all potential pest entry points, you will not only restrict access of sowbugs and pillbugs but a host of pests seeking to enter your home for food, warmth, or moisture. A pest control professional can offer safe perimeter applications that help to keep out a variety of pests. However, any such applications must be done in conjunction with permanent exclusion techniques so that your home itself is a barrier against the infiltration of pests. Springtails are tiny wingless insects about 1/16 inch long. They lay their round eggs in small groups in moist soil. Adults tend to be whitish, bluish, or dark gray to black. They get their name from their ability to jump up to several inches high using a tail-like mechanism tucked under their abdomen. When disturbed this appendage functions as a spring, propelling them into the air away from the danger. These small, jumping springtails can startle homeowners by appearing in large numbers in moist indoor areas such as kitchen sinks, bathtubs, and in the soil of houseplants. They usually appear in the spring and early summer, but can be found year-round in moist environments. Because thy jump when disturbed, springtails are sometimes confused with fleas. But, unlike fleas, they do not bite humans or pets or spread disease. Their startling presence makes them a nuisance. They tend to come indoors when they are in search of moisture. They enter homes through window screens, open doors, and vent pipes. After a hot day, they may congregate on the side of a building in tremendous numbers, increasing the chance of indoor infestation. Once inside, they seek out places of moisture like sinks, washbasins, and bathtubs. They may also occur around floor drains, in damp basements, crawl spaces, and wall voids. Without moisture, they soon die. Springtails are harmless scavengers, feeding mainly on decaying organic matter. They rarely cause damage to plants. They can also be nuisances for homeowners with swimming pools. Springtails manage to fall in and drown in large numbers with their dead tiny bodies coating the pool surface. For homeowners faced with a continuing presence of springtails inside their home, it is a sure sign of a moisture problem. Without moisture, these insects soon die. The key to managing springtails is to reduce moisture and excess organic matter in gardens, plant pots, and around building foundations. Screen or caulk cracks that provide entryway fro springtails into homes. Chemical applications should not be necessary and won’t provide long-term control by themselves. As with many insects, if you remove moisture, you remove the problem. The use of a fan can help aerate and keep moisture buildup down. Repair water leaks and sources of excess moisture. Avoid overwatering plants. The exclusion and sanitation recommendations for springtails apply to a host of insects seeking entry into your home. Repair torn screens and close up places where the springtail can enter the house such as spaces under doors and around windows. Use caulk, weather stripping, fine-mesh spring, steel wool, or expandable foam. Clover mites can be nuisances during the early spring and occasionally the fall. They are very small, reddish-brown insects that appear as moving dark spots to the naked eye. They leave a red stain if crushed caused by the mite’s body pigments. They are not blood feeders and are harmless to people and pets; they will not infest pantries or household products. Once inside a home or building, they die. Clover mites feed on clover and grasses and are abundant in well-fertilized lawns. They usually enter a home around windows or doors and are usually seen crawling along sills or thresholds. They are a temporary nuisance and usually disappear and quickly as they appear. Be careful to avoid crushing them and causing stains. There is increased potential for clover mites to invade structures when grass extends to the foundation. Also, avoid over-fertilizing lawns. If a large number of clover mites are seen on outside walls, a professional pest control operator has applications that will keep the mites from entering the home. It is recommended that non-chemical controls are used indoors sincere they are a temporary nuisance and cause no harm to people or pets. Often, a soapy rag or wet sponge is usually enough to clean mites off surfaces. It is much safer than introducing insecticides into the kitchen for such an innocuous insect. If you have a pest control issue, contact Cowleys Pest Services. We are your local pest control professionals, serving Edison, Woodbridge, Lakewood, Piscataway, Trenton, Toms River, Brick, Old Bridge, Princeton Junction, Middletown and surrounding New Jersey.